Governor Thomas E. Bramlette reacts to the news of Abraham Lincoln's assassination. 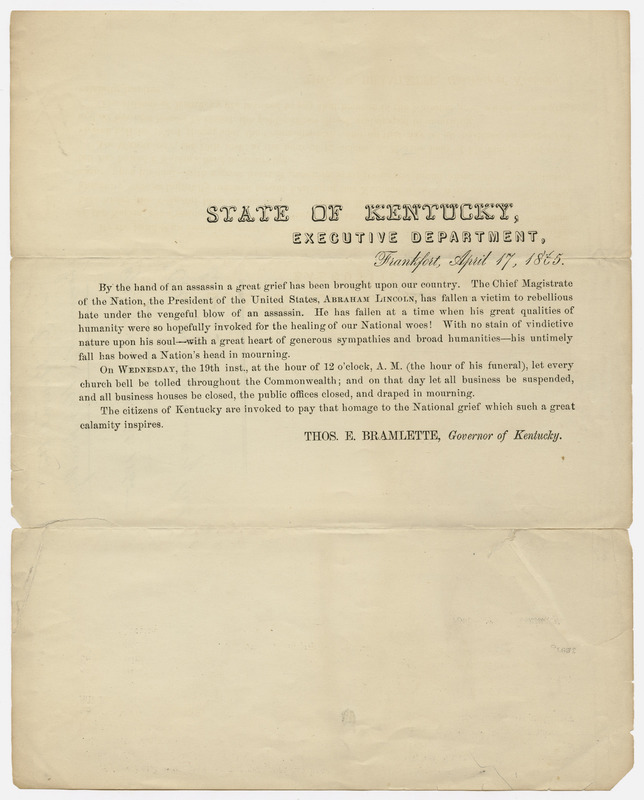 He also proclaims a day of mourning on April 19th at 12 o'clock for the entire state of Kentucky. By the hand of an assassin a great grief has been brought upon our country. The Chief Magistrate of the Nation, the President of the United States, ABRAHAM LINCOLN, had fallen a victim to rebellious hate under the vengeful blow of an assassin. He has fallen at a time when his great qualities of humanity were so hopefully invoked for the healing of our National woes! With no stain of vindictive nature upon his soul - with a great heart of generous sympathies and broad humanities - his untimely fall has bowed a Nation's head in mourning.